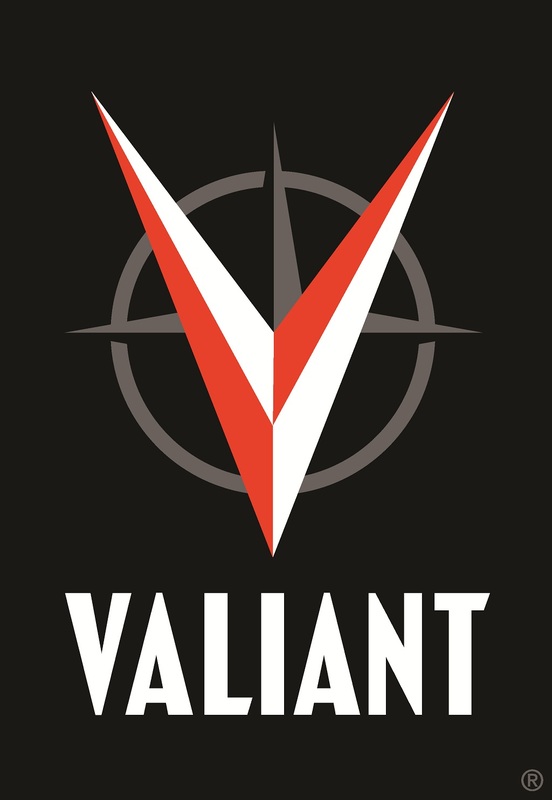 Founded in 1989 by former Marvel Comics editor-in-chief Jim Shooter and former Allman Brothers Band manager Steven J. Massarsky, Valiant Comics was a bold, new independent comic book publisher that brought together industry veterans like Barry Windsor-Smith and Bob Layton to stand shoulder-to-shoulder with the top of the pile of emerging publishers as part of the industry boom referred today as the Dark Age. 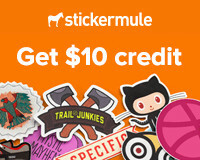 While there are several meanings behind being titled as such, one aspect of the Dark Age that earned its name is the bubble bursting for the comic book industry’s rise that led to the collapse of most of the market. One of these casualties was Valiant. However, Valiant has returned and is publishing four monthly titles based on their properties. Lets take a look at these characters making a come back (it should be noted, characters like Turok, Solar, and Magnus, Robot Fighter were licensed to Valiant by Western Publishing and this license has since lapsed). Aric of Dacia along with his uncle Alaric I and the Visigoths led a bloody war against the Romans. This changed, however, when the Spider Aliens attacked his tribe and took him as their slave. 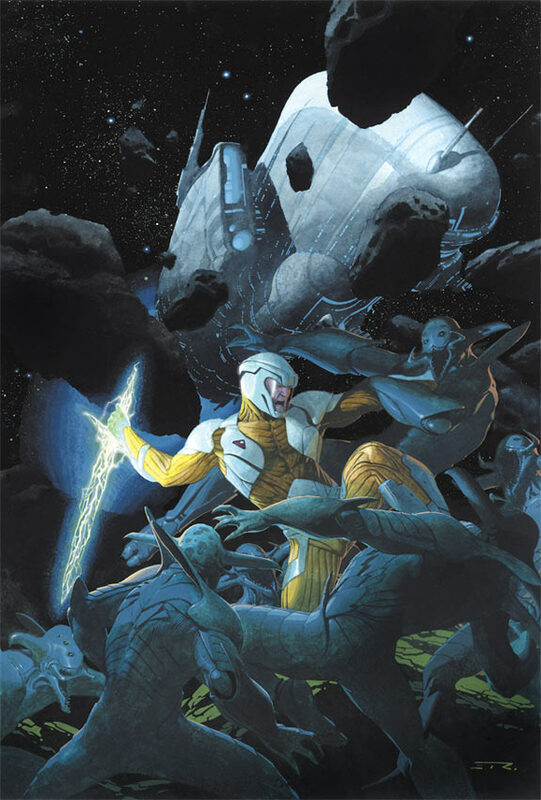 Serving in this capacity for several years aboard their space vessel, Aric managed to take control of his masters’ X-O Manowar class armor and fight his way back to Earth. He would learn despite only a few years passing aboard the Spiders’ ship, centuries passed on his home planet and though suffering a culture shock, Aric became a hero in this new world. X-O Manowar would prove to be a huge hit for Valiant, as word got out about Valiant’s quality (featuring art of then up-and-comer Joe Quesada), issues began being snatched up with X-O Manowar #0 reportedly selling between 800,000 to 900,000 copies and whose 70+ issue run sold over eight million copies. Created by Jim Shooter, Bob Layton, and Jon Hartz, X-O Manowar was the first franchise brought back for the reinvention of Valiant and was released May 2, 2012 by Robert Venditti, Cary Nord, and Stefano Gaudiano selling out from an initial print run of 45,000 copies and returning to print set to be released June 20th with a new wraparound cover. A variant of X-O Manowar #1 included a “talking cover” where using a QR code and smart phone over the cover makes Aric speak to the consumer. The series’ second issue goes on sale June 6th, 2012. Detailing the struggles of the secret war between the Harbingers, human beings who develop paranormal abilities, Peter Stanchek (aka Sting) searches out fellow Harbingers in a bid to stop his former mentor Toyo Harada and his massive Harbinger Foundation from conquering the world in order to save humanity from destroying itself. Along the way, Sting joins the Harbinger Resistance as Harada sends his elite Eggbreakers division to eliminate the hero and his allies. 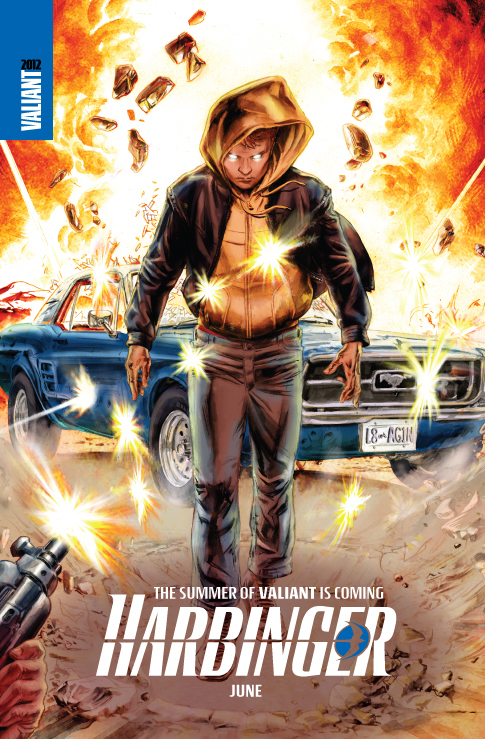 Created by Jim Shooter and David Lapham, the Harbinger 40+ issue series sold over five million copies, Harbinger #0 Pink Mail Away Variant became one of the most sought after collectibles of the Dark Age, and the 2008 trade hardcover collecting the first eight issues became the #2 graphic novel on Amazon. Likely the most long standing impression of Harbinger is how critically acclaimed the writing was, with many people citing the series as one of if not the best comic series of the Dark Age. Harbinger #1 goes on sale June 6th, 2012 written by Joshua Dysart and art by Khari Evans. A prolific hitman for the mob, Angelo Mortalli was on his way up the ranks at a breakneck speed so far as even dating the don’s daughter. However, his infidelity to his girlfriend proved to be his undoing when his boss ordered him to be framed for murder for his betrayal (and later his death when he turned state’s evidence). The near dead Angelo was taken to the secret Project Rising Spirit which took unwilling subjects and infused their blood with nanites in hopes of creating super-soldiers. Surprisingly, Angelo proved to be the organization’s first success, his body recuperating and enhanced with superhuman capabilities and yet, despite his brain being healed, the loss of oxygen to it would erase all of his memories. Awaking angry and confused, Angelo broke free, taking the name Bloodshot, and sought to reclaim his lost memories battling the mob, corrupt cops and government officials, and the government sponsored organization that tried to turn him into their mindless puppet. 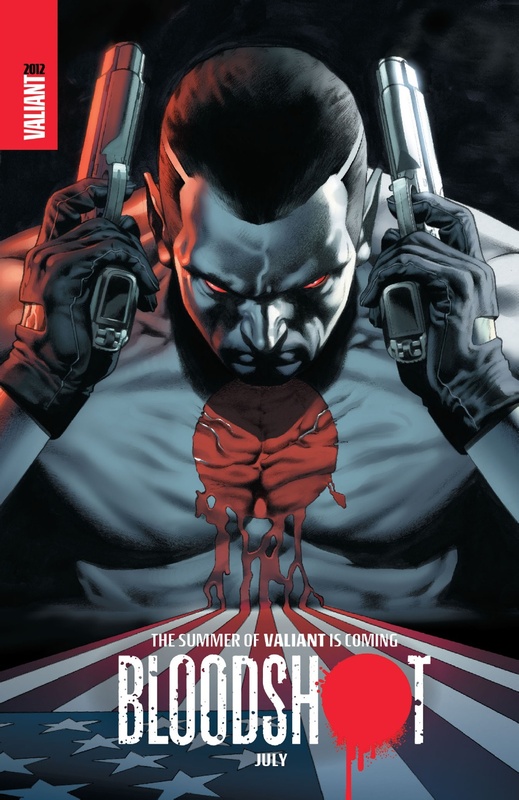 Bloodshot would prove to be yet another success for Valiant, the first issue selling near one million copies and its 50+ issue run sold around seven million copies. 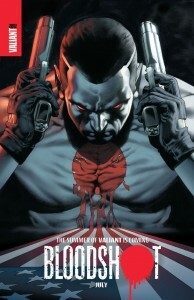 Bloodshot #1 goes on sale July 11, 2012 written by Duane Swierczynski and art by Manuel Garcia and Arturo Lozzi. One’s a highly trained martial artist and idealist. The other’s a super strong immortal that has lost faith in humanity and seeks comfort in the bottom of a bottle or a woman’s ample bosom. Together they form the oddest and perhaps most entertaining duo in comics. 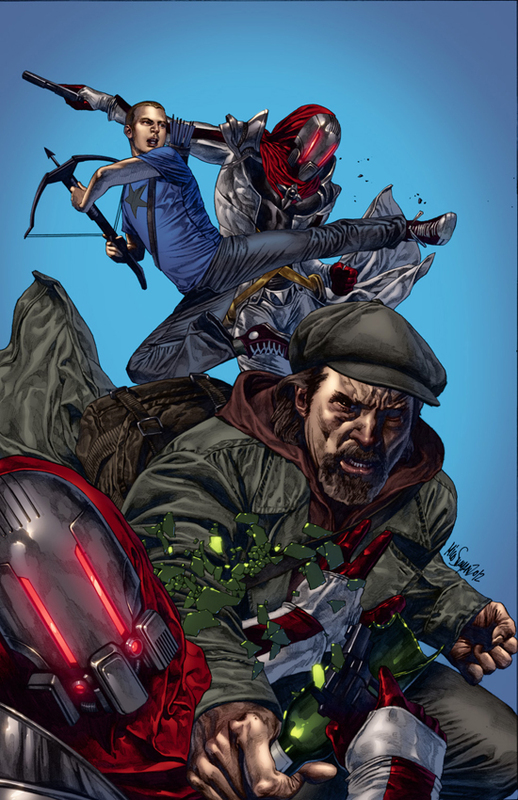 Created by Jim Shooter, Bob Layton, and Barry Windsor-Smith, Archer & Armstrong were yet another hit for Valiant, their 20+ issue run sold over four million copies and their trade Archer & Armstrong: First Impressions collecting their first seven issues made Diamond Comics Distributor’s top ten graphics novels of 2008. Obadiah Archer was the son of evangelists who uncovered his parents as molesters and serial killers at age eleven and they nearly murdered him for it. Finding his way to a Buddhist monastery in the Himalayas, Archer was raised by the monks and trained for ten years to fight so he can return to the world and bring his parents to justice. Aram the Strong was born ten thousand years ago and discovered he was super-strong, resistant to harm, able to heal from any injury, and stopped aging when he reached adulthood. After years of watching friends and family die around him, from war or old age itself, Aram punishes himself as a drifter named Armstrong that seeks out pleasure in all of its forms. Hunted by a massive cult that thinks he’s the devil given human form, Armstrong crosses paths with Archer (when the cult try to enlist him to their cause) and the pair have adventured since. Archer is armed with a small, handmade crossbow and Armstrong a massive collection of ancient artifacts in a seemingly bottomless satchel to battle the cult. 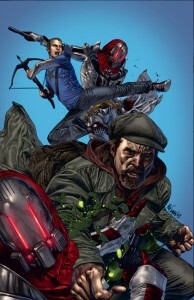 Archer & Armstrong #1 goes on sale August 8, 2012 by Fred Van Lente and Clayton Henry.